Home / Kona Coffee Reviews / Best Kona Coffee? Our Picks for the Best Kona Coffees. As a blogger of all things kona coffee, the question people ask me the most is this: “what’s the best kona coffee?”. It’s a simple and fair question, and yet I have trouble answering it. Why? For one, it depends on the time of day. I prefer brighter, more tart coffees in the morning and then I will go for smoother, darker and more chocolaty tasting coffees in the afternoon. It also depends on what your taste preferences are: do you like smooth, nutty coffees or floral, earthy type coffees? There’s great representatives of both in the spectrum of kona coffee. It has to be 100% Kona Coffee. ‘Kona Blends’ are 10% kona and 90% crappy ‘filler’ coffee. It’s gotta be smooth – I love smooth coffees. A little bite of acidity is okay, but on the whole I like coffee that goes down smooth. I’ve already written a review of Koa’s peaberry roast, but the Koa Estate Medium Roast is my go-to coffee mainly because it has a similar bright acidity while managing to have the subtle cocoa notes that I like so much. Many people prefer the Koa dark roast because it lessens the acidity. I respect that, but I like coffee that ends with a clean finish. Plus, it’s not like we’re talking about Starbucks breakfast blend, or any other super-acidic coffee that will leave your stomach in pain. An acidic kona coffee is probably less acidic than any single African coffee (this region is known for its bright and citrusy coffees). Koa’s Estate Medium Roast is also a good deal cheaper than the peaberry kona roast: $40/pound for the medium roast, compared to $50/pound for the peaberry. I also joined their monthly coffee club, so it actually works out to $36 per pound. I drink a fair amount of kona coffee, and this price is one of the most budget friendly kona coffees around. 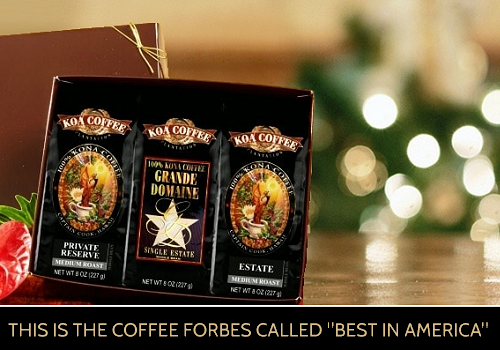 For one, this Estate coffee mixes the top three grades of kona coffee: extra-fancy, fancy and kona number 1 (with an inclincation towards extra-fancy) in this coffee. These coffee beans are the largest, most pure coffee beans (click here for more info about kona coffee grades). These coffee beans hold the most moisture and, hence, the most flavor. How you brew coffee can be as important as the coffee itself. Regular drip coffee makers filter out the natural flavor-creating oils of the coffee. I use the French Press to brew coffee mostly, since it preserves the natural oils in your coffee. It also enables you to detect all the subtle flavor notes of coffee that can sometimes be lost in the coffee brewing process. It would be a disservice to exclude all the other great kona and other hawaiian coffees available right now. These are my picks for coffees that have served me well in the past. Again, coffee flavor is a matter of personal choice, but hopefully you will find the right coffee for you. Starbucks Reserve coffees are limited edition specially roasted coffees that bring out the unique flavors of a particular coffee’s region. In other words, the “reserve coffees” aren’t over-roasted like the other Starbucks coffees. Currently Starbucks is offering a Kona coffee from Parry Estates. It’s one of the largest and highest elevation coffee farms, covering over 900 acres. Starbucks tends to only offer coffee from the Parry Estates once every couple of years due to the relative short supply of coffee available from Kona (at least by Starbucks’ standards). This coffee is as smooth as any kona coffee, and yet it’s the combination of flavors that make it so tasty: floral and caramel aromas to go with citrusy and nutty flavors. One sip of this coffee and you’ll be transported back to the Hawaiian Islands in no time. Keep in mind this coffee is in very limited supply and will only be available for a limited amount of time. Ka’u coffee has been making waves in the coffee world recently. The relatively new coffee region has won numerous coffee tasting competitions. This coffee by Rusty’s is my favorite because it has a mixture of chocolate and caramelly notes to start. These flavors then give way to a citrusy and floral aftertaste that is truly relaxing. Drinking a cup of this truly is an experience. Most people are surprised to hear than Maui has a robust community of coffee farms. Centered mainly in Ka’anapali, these coffees are grown at a lower altitude than most Hawaiian coffees but the resulting spicy and fruity flavors are quite tasty. The Pohaku o Ka’anpali (I don’t want to type that again) coffee is a rich, sweet coffee with caramelly notes. For me it’s a definite afternoon coffee as it’s silky smooth texture makes for a great coffee companion while working on the computer. Remember: To save on this coffee take note of the ‘Coffees of Hawaii’ promo codes above! There you have it. This list is not meant to be ‘exhaustive’ by any means, and it reflects my own personal preferences for coffee as anything. If you know what kind of coffee you like, what kind of flavors, then by all means try a few of these coffees, or even a few different roasts of one coffee company just to see what you like. We’re all on a coffee journey.